Category: Hardware, Language: E, cover: HC, pages: 0, year: 2018. Find your favorite necklace (doesn't need to be an expensive one), hang the battery+receiver around the neck, and listen wireless with a any lightweight earphone or headphone. 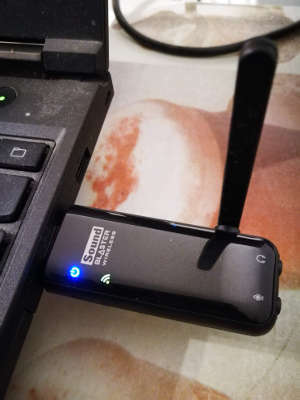 To switch the receiver off, you can use the RC, but this puts in in standby which consumes battery; so better plug off the USB connector from the power bank or connect it with a charger via micro-USB. 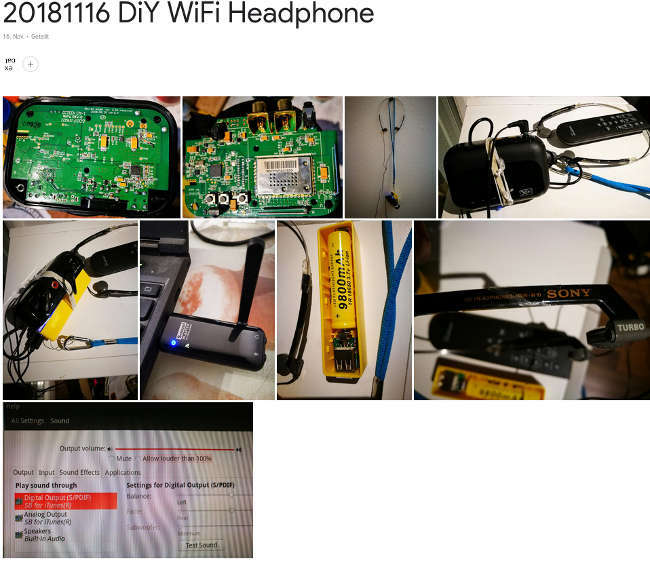 No wifi setup, uses own wifi-channel, emitter can not be detected by regular wifi-devices. No time delay (latency) between left and right channel. No computer setup required, no drivers to install; just select output device: "digital output S/PDIF SB" in settings/sound control. (if the s/pdif option doesn't appear in the selection, which can happen (under Linux) if the emitter was not connected at boot time, in a terminal type "pulseaudio --kill; pulseaudio --start" and it appears after you close and reopen sound settings). Compared to Bluetooth headphones, there is no pairing required, you get larger operating distance, usaulally longer battery life, you can freely choose your favorite head-/earphone, and with a suitable headphone, I bet, better sound quality.